There are important benefits when it comes to scheduling a roof inspection in fall before the harsh winter weather hits. Many people tend to believe that a roof repair isn’t necessary. However, if a problem is left undetected, you could be dealing with a larger expense (like a new roof) once spring comes around. Professional roofing contractors, like Eastbrook Construction, specializes in roof repairs in the Brighton area. They recommend that you get your roof checked out as soon as possible. Seek for Help: How are your shingles holding up? Do they need to be replaced immediately? Is it possible to hold off on roofing repairs for another season? The colder months can be hard on your home, so it is important to have a professional roofer answer these questions for you. By doing this will help you save money in the long run by noticing any issues head on. Snow and Ice: Before snow and ice start collecting on the roof, call your roofing contractor for advice. 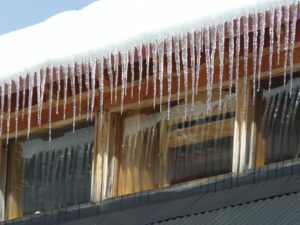 Once snow and ice begin to build, it can create leaks and weak spots that can lead to your roof collapsing. The Brighton, Fenton U.S. 23 corridor is a mini snow belt, your local roofing expert will tell you how to manage the snow & ice on the roof and gutter. Expand Curb Appeal: Roofing companies highly suggest to have roofing inspections done about once a year. If you plan to sell your home anytime soon, be sure that your roof is up-to-date. Home buyers prefer not to worry about things like this when it comes to purchasing a home. It’s better to just get your roof thoroughly inspected now before it’s too late. Did you know that Fall in Michigan is one of the busiest time for a roofer? Many home owners get their roof inspected and replaced prior to winter. Eastbrook roofing company of Howell, in Livingston County Michigan, can schedule an inspection and give you honest advice on your roof repair or replacement. With a wide variety of shingles and material to choose from our 20 plus years of experience as a professional roofing contractor is at your disposal. Keep your family safe and warm this fall and winter by having your roof inspected, repaired or replaced by a local independent roofer. So, what are you waiting for? Give Eastbrook a call or fill out our quote form today! This entry was posted in Roof Inspections, Roof repair, Roofing Contractor and tagged annual roof inspections, Professional Roofing Contractors Brighton, Roof Inspection Before Winter, Roof Repairs Brighton MI, roof replacement in fall. Bookmark the permalink.